Ellon Flowers are pleased to offer their huge and extensive range of funeral flowers so we are sure there will be something you like and that is suitable to the deceased. There are many options of wreaths to choose from so you can be assured that you pay your respects in the way that you wish. Flowers Ellon are different as our florists offer many types of funeral flowers, so if you are looking for something small such as a posy or something memorable and beautiful we have a range of funeral tributes, sheaths and various other funeral flowers to suit all your requirements. 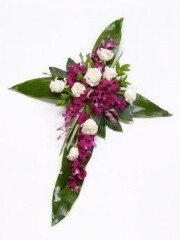 If you are unsure what would be suitable our team of expert florists will always be happy to lend you a hand. Our Ellen florists have extensive experience in providing funeral flowers so we are able to make a suggestion if you need any help. Here at Ellon flowers, we have a very wide range of flowers here in all different varieties so that there is sure to be something here that will be appropriate to include in your Ellon Flowers arrangement. At Flowers Ellon we provide only the freshest flowers to make sure your order is extra special. If there are particular flowers or colours you would like to have included, tell one of our Ellon Florists your preferences and we will ensure that these are incorporated into your Ellon Flowers arrangement because we want your order to be completed exactly as you would want and expect. We know that funerals are often hard and demanding times and we at Ellon Flowers understand this and we would assure that in organising any flower arrangements on your behalf you will have one less thing to worry about. Ellon Flowers offer same day delivery on all our orders to make sure they are received at the time when they are needed most. As long as your order is placed before 3pm, our team of Ellon florists will be able to get to work in creating your beautiful flower arrangement straight away. Our florists need some time to pick out the best, freshest flowers for your order and assemble them into your arrangement. We are also proud that we can deliver directly to wherever you need them to go, so if you are not attending the funeral or would rather we delivered them than you take them, Ellon Flowers can deliver directly to wherever you need them. Flowers Delivery Ellon can deliver anywhere in the UK so you can completely sure we will be able to take your order wherever you may need it. 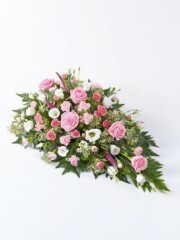 Our team of drivers will take the flowers exactly where you need them, so you do not need to worry. They deliver our high quality flowers with extreme care so you can guarantee that your order will arrive in perfect condition and with excellent presentation. During this hard time we know that things cannot afford to go wrong and we will ensure that nothing will. Customer satisfaction is our number one priority so you know you will have no problems if you order from us. If you have any further questions, please contact our team of dedicated florists with any queries and they will be happy to assist you in any way.